This table is no longer made by the Tornado company, but it used to be their competition quality table made for home use. The same table was made in a coin-op version that was sold for bar and tournament use, hence the name "Time Play". This table has now been replaced with the Tournament 3000 version. 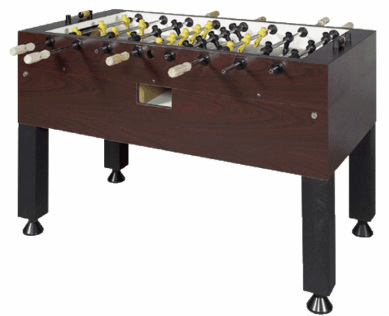 Now Tornado has invested in modern engineered parts to improve the foosball man toe, thinner and smoother bearings for the rods, lighter rods, and other commercial parts that make this model less desirable. However, if you are a collector or have the opportunity to get one of these, they still make a great table compared to the other department store tables out there today that come with cheap and flimsy parts. 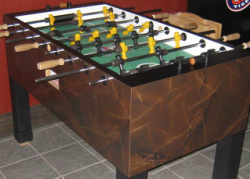 Some of the Time Play models came in a marble colored cabinet, as shown below.